Ben Model has made a career for himself as a silent-film accompanist, playing for audiences throughout the US (and a city in Norway!). I was thrilled to have him on the show and ask him how he got his start and how he reached the top of his field. We talk about the not-exactly-secret society of his peers, the challenge of reading and adapting to audience and movie simultaneously, the importance of audience preservation, the differences between playing live and recording a score for a movie, the reasons young and old audiences get engaged by silent movies, why you need to city Chaplin’s City Lights with a live orchestra, and more! Give it a listen! Ben & I also discuss the difference between digital and “real” instruments, the way his style has evolved from his college days, the Kickstarter revolution and how it funds his DVD label, the Stan Laurel comedy that makes little kids lose their minds, his love for Ernie Kovacs, the awful and sometimes incomprehensible stereotypes of century-old comedy, his theory of Undercranking, where the next generation of accompanists is coming from, the multi-decade dearth of comedic filmmakers with distinct vision, the lost comic genius of Marcel Perez, and what it’s like to create “music of momentary significance” (as his mentor described it). Go listen! Ben Model is one of the nation’s leading silent film accompanists, and performs on both piano and theatre organ. Ben works full-time presenting and accompanying silent films in a wide variety of venues around the USA and internationally, carrying on a tradition he learned from silent film organist Lee Erwin (1919-2000). 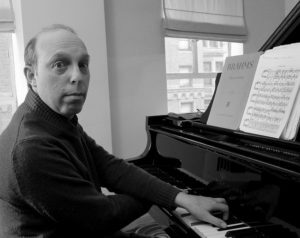 Over the past 30+ years Ben has created and performed live scores for several hundred silent films, films lasting anywhere from one minute to five hours. Ben is a resident film accompanist at the Museum of Modern Art (NY) and at the Library of Congress’ Packard Campus Theatre. His recorded scores can be heard on numerous DVD/Blu-Ray releases, on TCM and on his YouTube channel. His indie DVD label Undercrank Productions has released several discs of rare/lost silent films, including films preserved by the Library of Congress. Ben is a regular accompanist at classic film festivals around the U.S.A. and in Norway, and performs at universities, museums, and historic theaters. Ben is the producer and co-founder of The Silent Clowns Film Series, now in its 19th season in NYC. Ben has composed film scores for both orchestra and concert band for accompaniment to films by Chaplin and Keaton. These scores are performed around the U.S. every year by both professional and school ensembles. In his work as a programmer, Ben has co-curated a film series for MoMA, and co-programs a monthly silent film series at the Cinema Arts Center. As archivist of the Ernie Kovacs/Edie Adams collection, he also curated two recent DVD box sets of Ernie Kovacs television shows for Shout! Factory. He is currently a Visiting Professor of Film Studies at Wesleyan University. Credits: This episode’s music was Ben noodling on my friend’s Steinway. The conversation was recorded at my friend’s place in Manhattan on a pair of Blue enCORE 200 microphones feeding into a Zoom H5 digital recorder. B/W photo of Mr. Model by me; no attribution for the color photo.